The skeleton which is present at the axis of the body is called axial skeleton. There are 80 bones in the axial skeleton of an adult and 87 in infants. The skull consists of the bones of the head and it is divided into cranium and facial bones. Altogether, there are twenty nine bones in the skull. The frontal bone is one in number and forms the forehead or the front of the cranium. Parietal bone: The parietal bones are two in number and form anterior sides and the roof of the skull. Temporal bone: The temporal bones ate two in number and lie on each side of the head and form temples and complete the side-walls of the skull. Occipital bone: The occipital bone is one in number and forms the back of the head and the posterior base of the skull. Sphenoid bone: The sphenoid is one in number and it is bat shaped bone. Ethmoid bone: The ethmoid is one in number and lies in front of the sphenoid. Mandible or lower jaw bone: Mandible bone is only movable bone of the skull having 16 sockets for the lower set of the teeth on its upper edge. Maxillae or upper law bones: Maxillae bone forms a portion of the roof of the mouth, lateral walls of the nasal cavity and part of the floor of the orbital cavities. Palatine bone: Palatine bone are 'L' shaped and forms the upper part of the palate or roof of the mouth cavity. Zygomatic bones: There are two zygomatic bones which form the prominences of the cheeks and part of the floor and lateral wall of the orbit eyes. Vomer bone: It is a thin and flat single bone that extends upwards and forms the part of the middle partition in the nose and divides the two nostrils of the nose. Nasal bone: Two small flat bones that form the bridge of the nose. The lower part of the nose is formed of cartilage. Inferior nasal conchae: The two conchae are bones of the nose, one on each chamber of it. Lacrimal bone: These are two small lacrimal bones in inner wall of the orbit of the eyes. Lacrimal bone contains the passage for tears from the eyes to the nose. There are three bones in the middle ear which are called ear ossicles. It consists of two malleus, two incus and two stapes in the ears. The stapes are the smallest bones of the body. Hyoid is a ‘U’ shaped single bone and it supports our tongue. It is located in the neck region below the lower jaw. Trunk consists of bones of the vertebral column and the thorax. The vertebral column supports the head, helps in upright posture and locomotion. The individual bones of the vertebral column are known as vertebrae. Each vertebra is provided with the canal called neurocoel. Cervical vertebrae: The first two cervical vertebrae are different from all other vertebrae. The first cervical vertebra is called atlas. It supports the globe-like head. The second cervical vertebra is called axis. It helps in movement of head from side to side. Thoracic vertebrae: Thoracic vertebrae ate 12 in number and form the upper part of the back. Lumber vertebrae: Lumber vertebrae are 5 in number and form the lower part of the back. Sacral vertebrae or sacrum: In infants sacral vertebrae consist of 5 separate bones but in adult they are found fused to form a large wedge-shaped sacrum. Coccygeal vertebrae or coccyx: In infant, coccygeal vertebrae consist of 4 separate bones but in adult they are fused to form a very small triangular bone. There are 12 pairs of semi-circular bones present in the thorax called ribs and a long and broad bone called sternum. The spaces between the ribs are called intercostal spaces which are occupied by intercostal muscles. True ribs: The first seven pairs of ribs are directly attached to the sternum by means of cartilage called true ribs. False ribs: The 3 pairs of ribs are attached to that of the seventh pair of ribs and not to sternum directly are called false ribs. Floating ribs: The last true ribs which are free and do not even reach the sternum are called floating ribs. The skeleton which is present at the axis of the body is called axial skeleton. The skull consists of the bones of the head and it is divided into cranium and facial bones. Maxillae bone forms a portion of the roof of the mouth, lateral walls of the nasal cavity and part of the floor of the orbital cavities. Lacrimal bone contains the passage for tears from the eyes to the nose. Hyoid is a ‘U’ shaped bone and it supports our tongue. The vertebral column supports the head, helps in upright posture and locomotion. The first cervical vertebra is called atlas which supports the globe-like head. The last true ribs which are free and do not even reach the sternum are called floating ribs. Name the bones of cranium with their number. Name the bone of face with their number. How many bones are there in skull? Within skull, cranium contains 8 bones and face contains 14 bones. So, in total skull contains 22 bones. Give the name of two facial bones which are not found on pair? Out of eight different bones in face, mandible and vomer are not found in pair. Write a function of cranium and bone marrow. A function of cranium is it protects the most sensitive part i.e. brain of human body and a function of bone marrow is it replenishes insufficient calcium into the body. What is hyoid bone? Write its function. The single bone in the neck which lies above larynx and below mandible is called hyoid bone. Its function is to stick tongue. Name the bones present in ear ossicles. 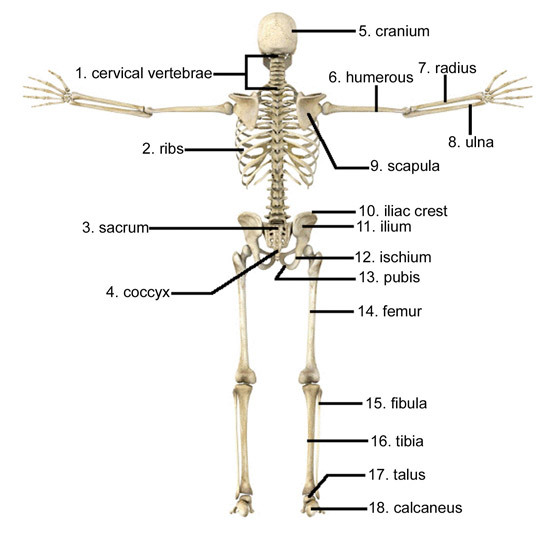 Name the bones of the following parts of human body. Trunk is made by the combination of vertebral column and the thoracic bones. How many pieces of bones are there in vertebral column? In children, vertebral column consists of thirty three small irregular separate vertebras where as in adult there is only twenty six vertebras. Write the name and number of vertebra bones found in vertebral column of a man in sequence. What do you mean by the atlas and the axis? Out of seven cervical vertebrae, the first one is called the atlas and the second one is called the axis. Name the different types of bones present in thoracic bone with number. The vertical bone at the centre of thoracic bone which acts as a cage around the lungs and heart is called sternum. Which of these is not a normal function of the skeleton? Choose the surface feature that represents a depression in a bone. There are ______ facial bones in the adult skull. The foramen magnum is located in the ______ bone of the skull. The nose and taste buds contain ________. Skin contains receptors for ______. Taste buds are located primarily on the _________. The skeleton which is present in the lateral side of a ______ is called Appendicular skeleton. How many bones in hind limbs? What portion of the radius articulates with the capitulum of the humerus? How many phalanges are present in each hand? What process makes up the outer ankle "bone"? What you mean by olfaction? 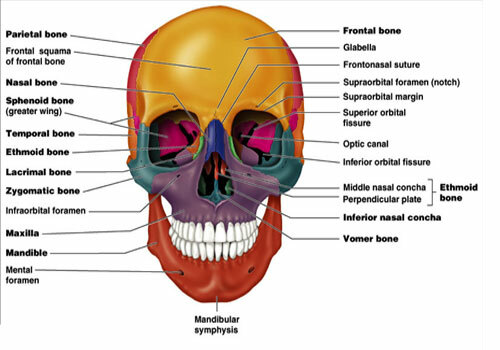 what are the functions of frontal bone? Any Questions on 'Axial Skeleton '?